Today, I’m going to check up on Saul. He’s been gone three years now, and I still check on him regularly. I met Saul when he was about three months old. I had stepped outside my office, and what I saw shocked me. A woman was walking up the street in front of my office. A puppy was trying to follow her, and every few feet she turned around and kicked him. She yelled and tried to make him run away, but the puppy followed desperately behind her. I hurriedly reported the woman to the police, and I ran to the puppy. He was yellow, a little pit bull puppy, with a dirty white chest. He was starving, and his eyes were running with thick, yellow discharge, with dirt matted in the streaks down his face. Not good, I thought. And then I gave him the same speech I give every one of my rescues. I said, “You don’t know it, but your life just changed. Today is your birthday. You have my word that you will never be hungry or thirsty again, and you will never again suffer at the hands of a human.” I followed up with a quick hug and a kiss on the head. I needed to hurry. I gathered him up, and he rode in my lap on the way to my house. During the twenty mile drive, he rested quietly. He was weak and exhausted. I worked on a mental list, thinking of all the things I needed to do for the pup as soon as I got him home. Once home, I took him to my bathroom, a makeshift quarantine pen. A big bowl of warmed homemade puppy formula with kibble was followed by a puppy vaccination. The pup resisted nothing. His tummy was full, and he just wanted to sleep. I washed him up with a warm cloth, but he barely noticed. He was snoozing the whole time. After feeding him throughout the first night, I was excited for morning. I know how fast puppies can bounce back from a rough start. I couldn’t wait to see him hydrated and rested. But that’s not at all what I found. The yellow eye discharge was back, and his nose was running too. The eager eater I had fed throughout the night was now turning away from the food I offered. Something was wrong. A quick consult with the vet confirmed what I had feared. This pup had distemper, an advanced case according to the vet. “What can we do to save him?” I asked. “Mary, just try to keep him comfortable,” my vet replied. I knew what that meant. This puppy’s rescue had come too late. I headed home, again with the pup in my lap. This time the sleep wasn’t so peaceful; he had developed a slight wheeze to go with the running eyes and nose. Dejected, discouraged, I knew what I had to do. I had two days, maybe three, to give this pup a lifetime of love. He deserved to be a pet, and to experience all the privileges that go with that title. For starters, a pet needs a name. “Hi, Saul,” I said to the little guy. I took him back into the house, and I gave him his own blanket, fuzzy fleece, navy blue with orange foxes. A pet deserves to have his own things. Next, I picked a toy for him, a little stuffed brown bear, soft, just right for a puppy. “This is yours,” I said to Saul. Looking up at me through watery eyes, Saul showed a hint of interest. For the next two days, Saul was my pet. I held him. I petted him. I situated his fuzzy blue blanket just right for him, so that only his face was peeking out among the foxes. I made sure he had his toy close to him, always there with my puppy and his blankie. I rocked him; I sang to him. And I loved him. I loved my sweet little pit bull baby with the yellow fur and the white chest. On the third day, Saul’s nervous system was overwhelmed by distemper and the seizures started. His time on earth was coming to a close. Another trip to the vet, and I held Saul in my arms, singing to him as the vet gave him the shot that ended his suffering. It’s been three years, and today I make my weekly visit to check on Saul. 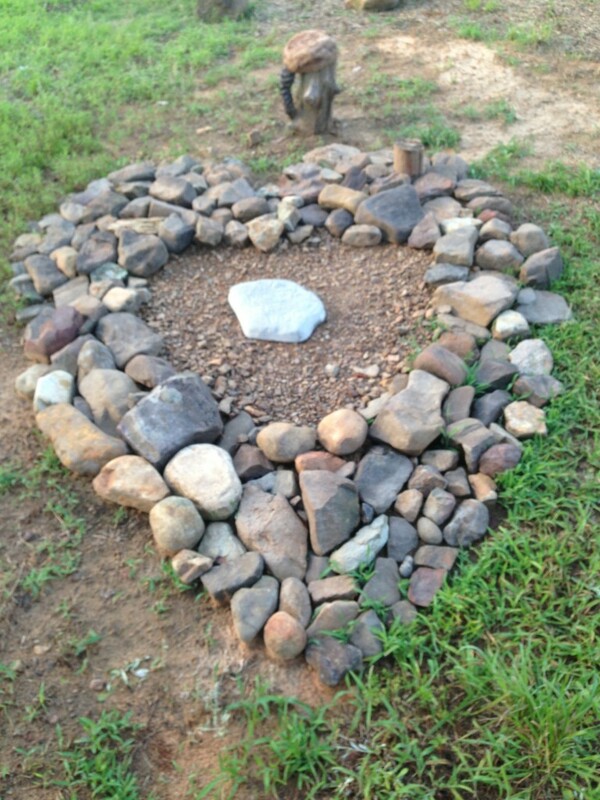 Resting among beloved family pets, Saul was honored with a burial befitting a cherished pet. When rescue comes too late, I still have an important service to provide. Saul was no less my pet than my dog of 15 years that rests next to him. I fit a lifetime of love in three days for my Saul, and in his lifetime, he knew what it meant to be somebody’s pet.